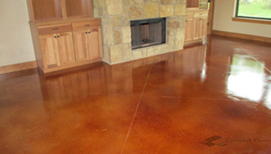 Welcome to the Custom Concrete Solutions website, your affordable flooring specialist. We've been helping homeowners, builders and property managers add value to their properties with textured concrete. Concrete Staining creates an uneven, variegated or translucent color effects much like the shadings of natural stone or the aged appearance of a timeworn patina. Distinctive and lasting, the look obtained is ideal for exterior hardscapes, interior floors, walls, and artificial rock and water features. The result is unique to each concrete surface and cannot be duplicated with other coloring materials. Engraving patterns, borders or custom scoring designs into the concrete surface adds dramatic effects or can mimic the look of popular flooring treatments. Concrete Stamping is the process of pouring and placing high strength, reinforced concrete and then treating the surface with highly specialized tools which create the antique finishes. There are significant advantages to this process over traditional materials. Concrete is more durable because of its strength and weather resistance. Driveways, pool decks, walkways, patios and entryways, often as an alternative to brick pavers or natural stone. Concrete is also more versatile because it can be poured and placed into virtually any shape, size or location. Finally, concrete holds finishes better than most ordinary materials. CCS projects always look their best, season to season, year after year. Concrete Polishing: Diamond polishing can be used for old or new concrete and requires little maintenance. Heavy-duty polishing machines equipped with progressively finer grits of diamond-impregnated segments or disks are used to gradually grind down surfaces to the desired degree of shine and smoothness. Appling a stain guard will also help protect the polished surface and make it easier to maintain. CCS can also remove all types of existing floor coatings by grinding the concrete floor with surface removers or metal bond diamonds. Overlays: If your concrete is worn and aged, it can be topped with a fresh, level canvas that can be decoratively styled to match any decor. They can be used both indoors and outdoors. a complete face-lift—and at a much lower cost than removal and replacement. Stampable overlays: Similar to conventional stamped concrete, but only ¼" to 1" thick applied over existing concrete. The finished look is that of truly authentic tile, brick, slate, flagstone, wood plank and more. Stamped overlay offers all the aesthetic benefits of conventional stamped concrete. 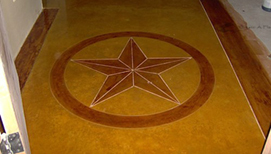 Custom logos and hand crafted custom flooring: Engrave company logo into your concrete with our custom concrete engraving services. We can custom engrave borders, flagstone patterns, collegiate logos, Texas stars, brick patterns, cobblestone, and the list goes on and on. If you can imagine it, we can engrave it! The possibilities are endless. 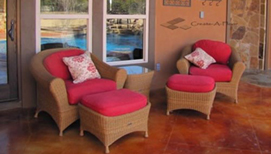 Custom Concrete Solutions utilizes cutting-edge creative techniques we look forward to assisting you or your client in creating beautiful, durable, and affordable stained concrete projects. may be reproduced in any manner without the prior written consent from Custom Concrete Solutions.